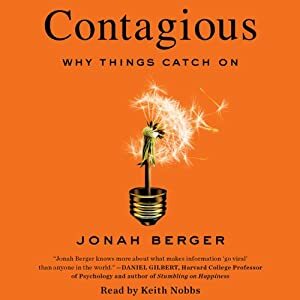 I’ve recently been listening to an audiobook by Jonah Berger called Contagious: Why Things Catch On. It’s based on Berger’s Ph.D. research into why some ideas or products get lots of word of mouth, while others don’t. It’s about a seven-hour audiobook that condenses his more academic work, and it’s good listening for workout time. Social Currency – How does it make people look to talk about a product or idea? Does it make people look smart? In the know? Kind, caring and empathetic? To get people talking, you need to craft messages that help people achieve these desired impressions. Make people feel like insiders. Use game mechanics to give people signs of status they can show to others. Triggers – “How do we remind people to talk about our products and ideas?” Triggers get people thinking about related things. “We need to design products and ideas that are frequently triggered by the environment, and and create new triggers by linking our products and ideas to prevalent cues in that environment. Top of mind leads to tip of tongue.” This video saw traffic spikes on the same day every week. Care to guess which day? Emotion – “When we care, we share…. Rather than harping on function, we need to focus on feelings.” But not all emotions increase sharing; some actually decrease it. The most important emotion to support sharing? Awe. As we saw with Susan. Public – “Can people see when others are using our product or engaging in our desired behavior?…Making things more observable makes them easier to imitate, which makes them more likely to become popular.” If we can create “behavioral residue” that is left behind even after the product is used or the idea is discussed, we’re more likely to get traction. The distinctive white ear buds on Apple’s iPod, when all other mp3 players used black headphones, is an example of this residue. Practical Value – “How can we craft content that seems useful? People like to help others, so if we can show them how our products or ideas with save time, improve health or save money, they’ll spread the word.” But we need to find ways to make our product or initiative clearly stand out as a particularly good deal. Stories – “What broader narrative can we wrap our idea in?” Stories are vessels that carry ideas like Trojan horses. We need to make our idea an integral part of the story, so people can’t tell the story without sharing the idea. Berger says this isn’t a recipe, in which all ingredients are needed, but rather more like a salad: the more of these elements are present, the more currency the idea will have. The ALS Ice Bucket Challenge clearly meets the test of contagiousness. How does it embody these six principles? It’s extraordinarily Public, with videos typically uploaded to YouTube or Facebook. It creates Social Currency, as many participants exercise and display their creativity in the videos. Others feel peer pressure, the negative side of social currency, to join once they have been challenged. The practice of challenging three others at the end of each video, and typically tagging them on Facebook, is a use of Triggers. Especially when shared on Facebook, it elicits Emotion as people see their friends shriek upon being doused. It is perceived as having Practical Value in raising funds to fight a terrible disease, and has yielded 25 times the amount donated in the same period last year. As I see it, probably the weakest element is Stories. Pouring icy water over one’s head does not have a logical relationship with ALS. This tactic could have been used in support of any charity; indeed, earlier this year a variation, the Polar Plunge, was being used to raise money for Special Olympics. A few other factors have helped the ALS Ice Bucket phenomenon. There are no long Ice Bucket videos. Shorter videos tend to get more views, and most Ice Bucket videos take less than 30 seconds. Challenging three others means that the idea can propagate if one or two of them join the fun. The ubiquity of video cameras on smart phones removes a barrier that could break the chain. And while Polar Plunges with submersion in freezing water can be seriously dangerous, victorious football coaches (especially those winning in upsets) experience a version of the Ice Bucket event on a weekly basis. The discomfort is transitory. Contagious is a good listen. Thinking about these principles, and how we have seen them applied in a recent health-related viral phenomenon, is a good way for those of us working in health care to better design the ideas we want to spread.